Gregg Cashmore, a prisoner at Grampian Prison, admitted assaulting the complainer to his severe injury at a house in Sundhamar, Lerwick, on July 19. Cashmore, 28, smashed the mug repeatedly into his victim’s head after he had been refused a loan of £20. 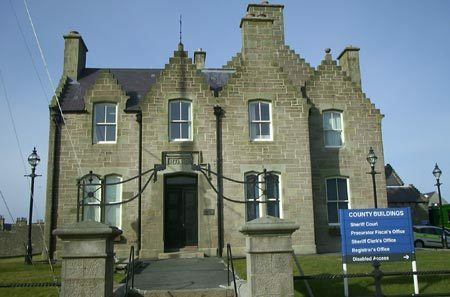 Procurator fiscal Duncan Mackenzie said the pair had been out drinking after Cashmore, originally from Ayrshire, had returned to Shetland, having previously gone south for work. Cashmore had been picking up possessions from the complainer’s house and a call to someone who owed him money had left him in a foul mood. It was when his friend turned down a request for £20 that Cashmore exploded, leaving him with six long lacerations in the head needing more than 20 stitches. The victim also had a depressed fracture in the forehead which doctors had said could be treated with a metal plate, but which treatment the victim had declined. Mackenzie said it was a “wholly unprovoked assault” that had left the victim with severe physical and even worse psychological injuries. He had experienced nightmares, flashbacks and panic attacks and had to take time off work. After the attack Cashmore had fled the scene and spent the night in a derelict building before escaping on the ferry south the following day. His victim had been “very confused” after the attack and had started walking to hospital and was picked up by a motorist who ran him the rest of the way. Tommy Allan, defending, said that Cashmore had been in custody since October and had been “remorseful” about the attack and “wished it had not happened”. Sheriff Ian Cruickshank said that two of Cashmore’s previous convictions had been for assaults with bottles and that considering his record and the seriousness of the latest assault he had no option but to send him to prison. Cashmore’s two-year sentence was to run from October 18, when he was taken into custody.